Taurine, ( 2-aminoethanesulfonic acid) is an ubiquitous sulfur-containing , ß-amino acid which is considered an essential nutrient in some species. It is found in high concentration in most mammalian tissues, but its concentration is particularly high in cardiac and skeletal muscle. Although it is considered to be an amino acid, it doesn’t participate in the formation of peptide bonds being deficient of the C-terminal carboxylic group. Taurine is synthetized in liver by the enzymatic degradation of cysteine. Then it is incorporated in bile acids such as cholic acid, producing taurocholic acid. It is important to remember that the bile acids are steroid acids and that bile salts are bile acids compounded with a cation, usually sodium. In humans, the salts of taurocholic acid and glycocholic acid (both derivatives of cholic acid) represent approximately eighty percent of all bile salts. Although it has been suggested that taurine can serve as an antioxidant, the sulfonic acid is incapable of scavenging the common oxidants, namely, superoxide, hydrogen peroxide and hydroxyle radical. Nonetheless, the amino group of taurine can neutralize hypochlorous acid, one of the reactive species generated by neutrophils. In that reaction , taurine is converted to taurine chloramine, which is less toxic than hypochlorous acid and serves as a modulator of the immune system. The amino group of taurine is commonly involved in conjugation reactions that play central roles in the elimination of toxins from the body, the metabolism of lipids (via bile acid conjugation, as we already said) and the activity of glycolipids. However, the relative chemical inactivity of taurine makes the b-amino acid attractive as a modulator of basic processes, such as osmotic pressure, cation homeostasis, enzyme activity, receptor regulation, cell development and cell signaling. It is proved that a deficiency of taurine determines cardiomyopathies in several species and it is generally accepted that hearth failure is characterized by impaired contraction due to many conditions that are caused by a lack of taurine. Taurine has a role in the regulation of calcium homeostasis since several studies provided evidences that physiological concentrations of taurine can increase Ca²⁺ sensitivity of contractile proteins and alter tension development. 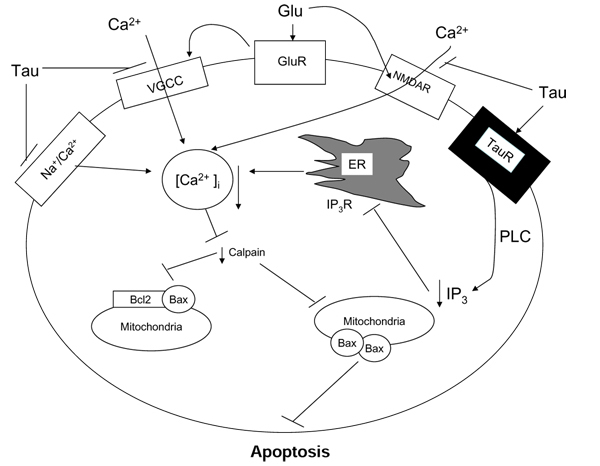 In fact, in vivo chronic taurine influences the activity of the sarcoplasmic reticular Ca²⁺ ATPase through at least two factors. First, recent evidence reveals that the phosphorylation of the sarcoplasmic reticular phosphoprotein phospholamban is reduced in the taurine deficient heart. Because the phosphorylation of phospholamban enhances the rate of Ca²⁺ uptake by the sarcoplasmic reticulum, it increases the rate of myocardial relaxation. Second, taurine has an “antioxidant” effect that prevents the inhibition of the activity of the sarcoplasmic reticular Ca²⁺ ATPase by oxidative stress. Its antioxidant effect consists in the neutralization of HOCL ,which is converted to N-chlorotaurine (as already said). Since the second compound is less toxic than the first it has been supposed that the neutralization of HOCl by taurine might limit myocardial damage caused by neutrophils. Moreover , recent studies have uncovered a key action of taurine in regulating the rate of ROS generation by the mitochondria. This is important because elevated superoxide generation by the mitochondria is capable of initiating the mitochondrial permeability transition, which triggers the apoptotic cascade. Taurine modulates the sarcoplasmic reticular Ca²⁺ release, with the effect greater in preparations containing Ca²⁺ deficient sarcoplasmic reticulum, but less when the sarcoplasmic reticulum contain a high Ca²⁺ load. It has also been shown that the phosphorylation of troponin I in the hearth is significantly elevated in taurine transporter knockout mice. Because the phosphorylation of troponin I diminishes tension development by interfering with the binding of Ca²⁺ to troponin C, the taurine deficient heart should generate less ventricular pressure. This conclusion confirms that taurine deficiency is associated with a decrease in the sensitivity of cardiac muscle to Ca²⁺(as we already said). Several studies also show that there is a loss of myofibrils in drug induced taurine deficient hearts, a finding consistent with the notion that taurine deficiency is linked to the loss of cardiomyocytes via apoptosis. It is known that sarcoplasmic Ca²⁺ uptake by and Ca²⁺-induced Ca²⁺ release play key roles in regulating [Ca²⁺]i and modulating Ca²⁺delivery and removal from the muscle proteins. Moreover, the binding of Ca²⁺ to troponin determines the response of the muscle proteins to elevated [Ca²⁺]i. Therefore, it is not surprising that taurine is required for normal systolic and in diastolic function. Taurine also appears to be essential for normal contraction in skeletal muscle and several findings show that skeletal muscle function is severely impaired in taurine transporter knockout mice, an effect partially prevented by taurine administration. Administration of taurine also improves physical endurance and this effect is particularly interesting since an acute exposition to elevate levels of taurine, induced for example by taking energy drink taurine-based such as Red Bull®(which contains about 400 mg/dl), can effectively ameliorate the exercise performance. In accordance with the actions of taurine in the heart, it is reported that the effects of taurine in muscle are at least partially explained by an augmentation in sarcoplasmic reticular Ca²⁺ accumulation and release. Taurine has an osmoregulatory activity in hearth and muscle. In fact, changes in taurine uptake and release contributes to the normalization of cell volume in most cell types. This volume regulatory mechanism counteracts the consequences of osmotic stress. In the case of hearth and muscle, the turnover of taurine is normally very slow. Yet myocyte taurine content can be dramatically altered by changes in osmotic stress. Several works reported that cardiomyocytes exposed to hypoosmotic stress undergo cell swelling, followed by a volume regulatory event that extrudes osmolytes, such as taurine, from the cell. In contrast to the response to hypoosmotic stress, the regulatory response to hyperosmotic stress leads to increased taurine influx into the cell. This phenomenon is explained by the fact that the promoter region of the taurine transporter contains a transcriptional tonicity-responsive element (TonE), which along with the TonE binding protein is involved in the upregulation of the taurine transporter in the hyperosmotically stressed cardiomyocyte. While osmotic stress affects taurine transport, changes in taurine levels can also affect the transport of other ions through alterations in osmotic stress. One such change occurs during pharmacological elevations in extracellular taurine, which enhances Na⁺-Ca²⁺ exchange activity and elevates [Ca²⁺]i . Similarly, elevations in intracellular taurine often mimic osmotic-mediated cell swelling. Among the transporters that are stimulated by both cell swelling and elevations in intracellular taurine are the fast Na⁺ current and Cl⁻ current. The interaction between taurine and Na⁺ movement is attributed to the cotransport of taurine and Na⁺ via the taurine transporter. Because hyperosmotic stress promotes the upregulation of the taurine transporter, while a rise in intracellular taurine simultaneously increases the osmotic load and mass action-mediated efflux of taurine and Na⁺ via the taurine transporter, the association between the effects of taurine and certain types of osmotic stress are predictable. The osmoregulatory activity of taurine appears to be an important determinant of cell survival. In fact, during the process of apoptosis, apoptotic cells, undergo an exaggerated activation of the regulatory volume decrease in which taurine effluxes the cell. If the regulatory volume decrease is disrupted by preloading the cells with taurine, several apoptotic steps, such as DNA fragmentation and apoptotic cell shrinkage, are prevented. In particular taurine blocks the progression of the apoptotic cascade beyond the cell shrinkage step. Although taurine loss during apoptotis has an adverse effect on the cell, the loss of taurine during a normal regulatory volume decrease can benefit the hypoosmotically stressed cell by serving as a safety valve to prevent membrane damage caused by excessive cell swelling. This occurs in the ischemic heart, which accumulates osmolytes, such as lactate, phosphate and sodium. It is reported that drug-induced taurine depletion reduces the taurine gradient across the cell membrane of the ischemic heart, a factor that contributes to the observed protection against ischemic injury. Other factors contributing to the observed cytoprotection are alterations in the levels of cationic osmolytes, such as Na⁺, and activation of cytoprotective protein kinase pathways. In heart, reductions in taurine levels determines the phosphorylation of pyruvate dehydrogenase while elevated levels of taurine induce the dephosphorylation of it. Pyruvate dehydrogenase is an enzyme which converts pyruvate in Acetyl-CoA, which enters the citric acid cycle. A taurine depletion leads to a significant elevation of lactate and pyruvate production and also to the reduction in pyruvate utilization by the citric acid cycle. The enzyme involved in the phosphorylation of pyruvate dehydrogenase in the taurine deficient heart has not been identified yet, but the response to inhibitors ruled out any involvement of cAMP and cGMP dependent protein kinases. Protein kinase C is also closely related to the osmoregulatory activity of taurine. Hypoosmotic stress promotes the translocation of selective protein kinase C isoforms (PKCa, PKCε, and PKCζ) to specific membranes, an event associated with their activation. The activation of these protein kinase C isoforms contributes to the osmoregulatory actions of taurine by activating a signaling pathway in which an early event is the stimulation of NADPH oxidase. In the hypoosmotically stressed cell, NADPH oxidase-derived ROS inhibits protein tyrosine phosphatase 1B, which potentiates swelling-induced taurine release. Taurine has many different roles in human central nervous system. Above all taurine is a neurotransmitter, a neuro-protective agent and a regulator for intracellular calcium homeostasis and we are going to focus on these particular functions. Several studies prove that taurine is neurotransmitter. * An inactivation mechanism is present to terminate the action of the suspected neurotransmitter. * The presence of a taurine transporter system for inactivation of its function has also been reported. In fact, taurine transporters have been cloned and taurine transporter knock-out transgenic mice have been established. In summary, taurine has fulfilled most of the criteria to be accepted as a neurotransmitter in the mammalian CNS. It is known that the level of intracellular free calcium, [Ca²⁺]i, is maintained at sub-micromolar concentration by calcium sequestering into internal calcium storage pools, mitochondria, endoplasmic reticulum (ER) as well as pumping out to the extracellular space by calcium- ATPase. When neurons are stimulated by glutamate, the [Ca²⁺]I level is elevated due to influx of calcium from extracellular sources through various calcium channels including NMDA receptors, voltage-gated calcium channels (VGCC) such as L-, N- and P/Q-type, reverse mode of Na⁺/Ca²⁺ exchanger as well as release of calcium from the internal calcium storage pools. However, in the presence of taurine, glutamate induced increase of [Ca²⁺]i is markedly reduced as shown in Fig 1. Effect of taurine on glutamate induced [Ca2+]i accumulation (A) confocal study. It is reported that one of the pathways by which taurine reduced glutamate induced elevation of [Ca²⁺]i is through inhibition of Ca²⁺ influx via the reverse mode of Na⁺/Ca²⁺ exchanger. At the resting membrane potential, Na⁺/Ca²⁺ exchanger functions to move Ca²⁺ out of the cell. However, under depolarizing conditions such as under glutamate stimulation, it reverses its function to facilitate Ca²⁺ influx. The effect of taurine on Na⁺/Ca²⁺ exchanger has been suggested to be in part due to its membrane stabilizing activity. Taurine also promotes Ca²⁺ efflux via the Na⁺/Ca²⁺ exchanger by increasing [Ca²⁺]i in the vicinity of the exchanger. In addition to Na²⁺/Ca²⁺ exchanger, taurine also inhibits the release of Ca²⁺ from internal pools as well as inhibits various voltage-gated calcium channels (VGCC) such as L-, N- and P/Q-type. It is believed that in neuronal systems, the effect of taurine on various calcium channels is likely due to a combination of counteraction of glutamate-induced depolarization by taurine as well as receptor-mediated G-protein coupled events. It is also believed that when the metabotropic taurine receptors (mTauR) are activated by taurine, the coupled inhibitory G-proteins Go/Gi are then activated resulting in inhibition of VGCCs. 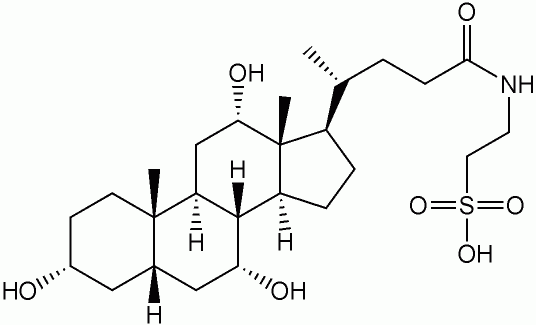 Furthermore, it is supposed that mTauR are negatively coupled to phospholipase C (PLC) through inhibitory Gproteins. 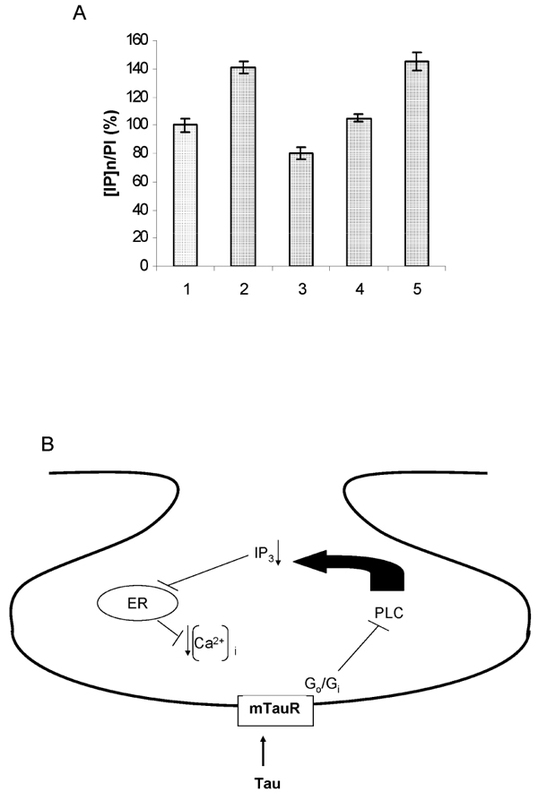 Activation of taurine receptors by taurine would lead to inhibition of PLC activity (Fig 2), resulting in reduction in IP3 formation and hence IP3-mediated release of Ca²⁺ from the internal pools. A. Effect of taurine on PLC activity; B. A proposed model for the mode of action of taurine on the IP3 pathway.A. Effect of taurine on PLC activity. B. A proposed model for the mode of action of taurine on the IP3 pathway. 1. Taurine reduces glutamate-induced elevation of [Ca²⁺]I by inhibiting calcium influx from various calcium channels including the reverse mode of Na⁺/Ca²⁺ exchanger, various voltage-gated calcium channels (VGCC) such as L-, N- and P/Q-type, and glutamate NMDA receptors. 2. Taurine inhibits phosphorylation of VGCC resulting in decrease of calcium influx and also reduces the release of calcium from the internal storage pools presumably due to inhibition of phospholipase C.
3. Taurine inhibits glutamate-induced activation of calpain and the subsequent hetero-dimerization of Bcl-2 and Bax protein resulting in inhibition of release of cytochrome C and the apoptosis cascade (Fig 3).